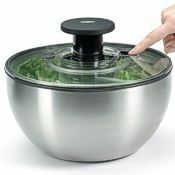 The OXO SteeL salad spinner is a simple and efficient way to dry freshly washed greens. By simply pressing the knob the colander inside spins quickly, drying the greens and stops promptly with a touch of the brake button. 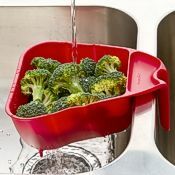 The nonslip base keeps the bowl from rocking off the counter, and the stainless steel bowl doubles as an attractive serving bowl. The lid comes apart for easy cleaning and all components are dishwasher safe. GrapeOla Grape Seed Oil, 34 oz.